I'm a nature person and when visiting new and exciting places I enjoy the wilder side-meaning of course, nature not the other type of wild life. My online trips to New York have brought me to the Great Swamp National Wildlife Refuge...so I am going to share a little about the refuge and what I have learned. 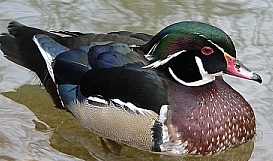 The picture I am including is a picture of a wood duck...according to my research the Great Swamp is home to more than 500 breeding pairs of wood ducks...meaning if you visit the Great Swamp you should probably see at least a few wood ducks. I think they are beautiful. One of God's inspiring works of art. Keep this in mind when doing art-it is ok to use colors in unexpected ways. Check out the picture...what an amazing mix of colors all on one masterfully created being. Enough about the ducks...what else can you find at the Great Swamp Refuge? Covering over 7,355 acres of land the swamp is primarily wetlands, ponds, swamps and marshes with a few forests and pastures. The land is mostly undeveloped except for hiking trails. Hiking is the main activity that you can do there. While hiking you might get to see pileated woodpeckers, skunks, muskrats, bog turtles and eastern bluebirds(Another bird I think is absolutely beautiful). wetland areas make this a place I would definitely be interested in visiting. Have you visited the Great Swamp National Wildlife Refuge? Would you consider telling us more about what it was like and/or share a picture? We know we have a chance of seeing ducks but will we get eaten up by mosquitoes or does it smell like dead fish or fresh water? Tell us about your experience at the Great Swamp. What is the difference between a swamp, a pond and a marsh? Write a paragraph and post it along with a picture,if you have one. Pleasant Plains Road is south of exit 26 on the Garden State Parkway. An Observation Center can be found on Long Hill-New Vernon Rd. From New York City: Take Rte. 80 west to I-287 and go south on 287 to exit 30A, which is the Basking Ridge/North Maple Avenue exit; stay on North Maple Avenue to first traffic light and follow refuge directional signs. Join in and write your own page! It's easy to do. How? Simply click here to return to New Jersey Geography.